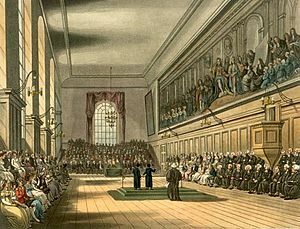 The Blue Coat School (in this case Christ's Hospital, London) as drawn by Augustus Pugin and Thomas Rowlandson for Rudolph Ackermann's Microcosm of London (1808-11). The picture shows the Great Hall on St. Matthew's Day, September 21st. Two senior boys destined for scholarships to Oxford and Cambridge Universities, known as Grecians, gave orations in praise of the school, one in Latin and the other in English. Charity schools, sometimes called blue coat schools, or simply the Blue School, were significant in the history of education in England. They were built and maintained in various parishes by the voluntary contributions of the inhabitants to teach poor children to read and write, and for other necessary parts of education. They were usually maintained by religious organisations, which provided clothing and education to students freely or at little charge. In most charity schools, children were put out to trades, services, etc., by the same charitable foundation. Some schools were more ambitious than this and sent a few pupils on to university, as depicted in the illustration. Charity schools began in London, and spread throughout most of the urban areas in England and Wales. By 1710, the statistics for charity schools in and around London were as follows: number of schools, 88; boys taught, 2181; girls, 1221; boys put out to apprentices, 967; girls, 407. By the 19th century, English elementary schools were predominantly charity schools. Christ's Hospital, Horsham 1552 Independent boarding school. The oldest surviving Bluecoat school. Norwich School for Poor Boys, Norwich 1617 Also known as the Anguish School, founded by bequest by Thomas Anguish, former mayor of the city. Reading Blue Coat School 1646 Secondary school founded by Richard Aldworth. Blue Coat School, Basingstoke 1646 Founded by Richard Aldworth. The Blue Coat School, Dudley 1869 Closed in 1989. Bishop of Hereford's Bluecoat School 1973.